BBX has been setting the standard for the transportation of refrigerated and dry freight throughout the US and Canada, for over a decade. We pride ourselves in consistently providing on-time delivery that is efficient and cost-effective for our loyal customers. In fact, within our specialized seafood division our motto is “Sea to Store in 24.” We deliver seafood straight from the fishermen’s nets, to retailers’ docks within 24hrs. 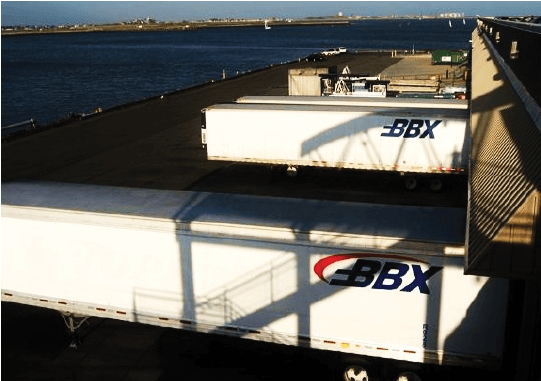 Just as we have perfected in the seafood industry, BBX also offers unparalleled excellence in the transport of all refrigerated products, as well as dry goods, with routes across the US. When it comes to refrigerated and dry product delivery, no one does it better or gets it there as fast and fresh. At BBX, we are continually setting the standard for quality of service in the transportation industry. Our mission is to provide unequivocal excellence in transportation and logistics services, through the utilization of safe, dependable, on-time, and cost effective individualized solutions for our customers. BBX routes are focused around its corporate headquarters and eight terminals, while offering solutions to the Midwest, West Coast, and Canada. BBX handles routes across the United States and into Canada. The company headquarters is located in Lockport, NY with terminals across the Northeastern United States in Albany, NY; Bedford, IN; Boston, MA; Buffalo, NY; Cleveland, OH; Erie, PA; St. Catharines, ON Canada; and Syracuse, NY. BBX drivers haul freight throughout this region daily. West Coast transport is also available; with five day rail service from coast to coast. Regardless of distance or terrain, BBX delivers a quality, on-time product to its customers. Whether you’re a customer looking for short range transport, or a large company with business all across North America, BBX will find a solution for you. From our drivers and dispatch, to our mechanics and office staff, BBX’s strength lies in the incredible people who work here. The BBX team is comprised of Ambitious, Motivated and Reliable Professionals – ALL the very best in their chosen fields. We share the common vision that our customer’s success equals that of our own, and seamlessly combine our individual talents in pursuit of this goal. Loyal, Ambitious, Dynamic professionals all working together to provide the very best service delivery in the industry- that’s the BBX difference. Customer service and safety go hand in hand at BBX. Our consistent “Satisfactory” safety ratings by the Department of Transportation, allow us to provide first class service to our prestigious clientele, who demand only the very best. To ensure a high standard of safety, BBX is intensely invested in the comprehensive training and ongoing support of our drivers. As a result, our drivers are some of the safest on the road and at customer sites. Our customers choose BBX because they know they can trust us to provide services in only the most safe and conscientious ways. We are proud of our safe drivers and like to show it! BBX awards special recognition to those drivers who are committed to operating their equipment safely, travel incident free and maintain clean logs. Safety is paramount to the entire BBX organization. We are committed to ensuring that our drivers have the training and experience they need to successfully meet a high standard of safety. Fleet-wide weekly audits as well as monthly safety training ensure that BBX drivers are mentored on the most safety-conscious ways of professional driving. Drivers are always welcome to ask questions, and get extra assistance regarding logs, DOT inspections and general safety so that they feel confident and completely knowledgeable in these areas.